Extrusion is a industrial process which consists in forcing a viscous fluid (a molten glass or a polymer solution) to flow through a shaping pipe (a “die“). Once frozen, the extrudate is ready for use, for instance as a textile fibre. In some cases however, the fiber appears unexpectedly misshapen, thus revealing that the flow became unstable. Over decades, engineers have drawn up a catalog of the various defects which may affect either the surface, or the bulk of the extrudates. They coined suggestive expressions such as « sharkskin » or « melt fracture » to describe these instabilities... which they do their best to get rid of ! Conversely, studying instabilities – where does the flow become unstable in the very first place, which characteristics of the fluid are relevant ? – can be considered a powerful way to reveal the physical mechanisms underlying the flow of complex fluids. Such is the aim of the « multiscale mechanics of soft solids » team when seeking for extrusion instabilities of gelable biopolymer solutions. These are both elastic and viscous (viscoelastic) fluids which exhibit a strong shear-thinning viscosity, i.e. they flow all the more easily as the troughput is higher. 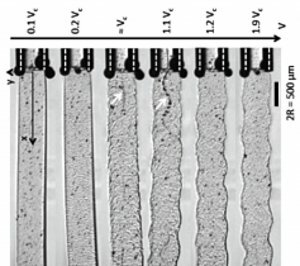 This work combines the systematic characterisation of the extrudate profile with the visualization of tracer paths in a transparent capillary. It reveals that at high enough throughput the extrudate oscillates and twists. Such helical instabilities are usually ascribed to the destabilization of the convergent flow at the capillary entry. When dealing with polymer melts, experimental evidence of such a localization are numerous. For instance, the oscillations usually vanish when the length of the capillary is increased. Our study exhibits the opposite trend, therefore proving that here the instability develops spontaneously in the body of the capillary. This is an important result insomuch as predicting the general conditions for the stability of a viscoelastic flow (at vanishing Reynolds number) in a straight pipe remains an essentially open issue. A 20 years-old theoretical prediction of fluid mechanicians is that, for strong enough shear-thinning fluids, the flow should become unstable above a critical shear rate (ratio of the extrudate velocity and the capillary radius) depending on viscoelastic characteristics of the fluid. For the first time, this prediction has been checked in details. 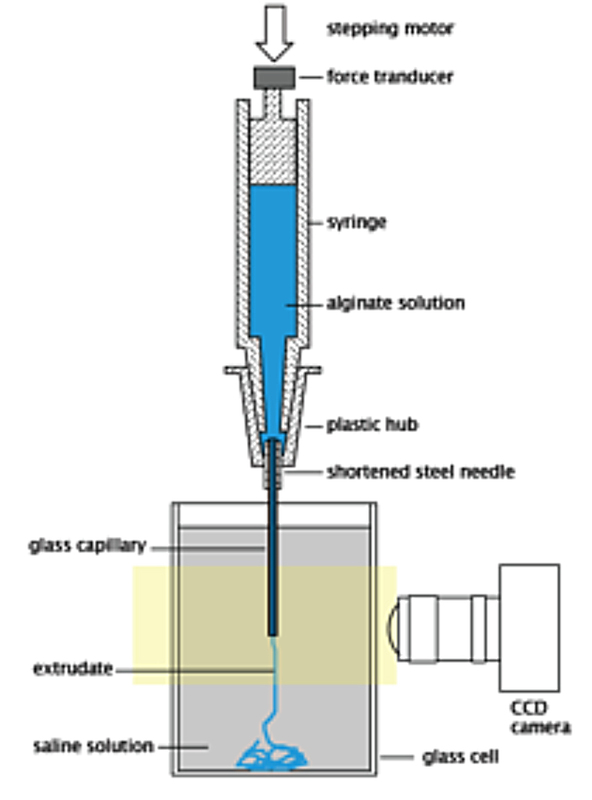 Experimental setup for the extrusion of a viscoelastic alginate solution. Extrusion in a bath makes gravity and surface tension irrelevant. Extrusion profiles for increasing exrtrusion velocities (V in mm/s). Dashed lines delineate the inner bore of the capillary (radius R = 250 µm). The rough pattern is due to the sharkskin instability occuring at the capillary exit where very large stress and strain fields develop as the boundary conditions change from no-slip to no-shear. The oscillations are clearly visible above V = Vc. The experimental value of Vc is compatible with the theoretical prediction for a bidimensional flow through a slit of thickness h = R. The fully tridimensional, helical instability, still remains out of theoretical and numerical grasp. 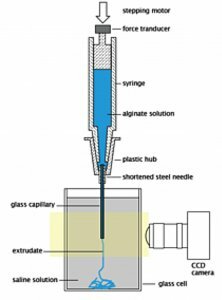 Beyond adressing physico-mechanical issues (such as : how would a weakly fluid-thinning fluid behave ? Is it possible to stabilize the flow through slip-promoting wall treatment ? ), this study could have unexpected consequences in tissue-engineering. 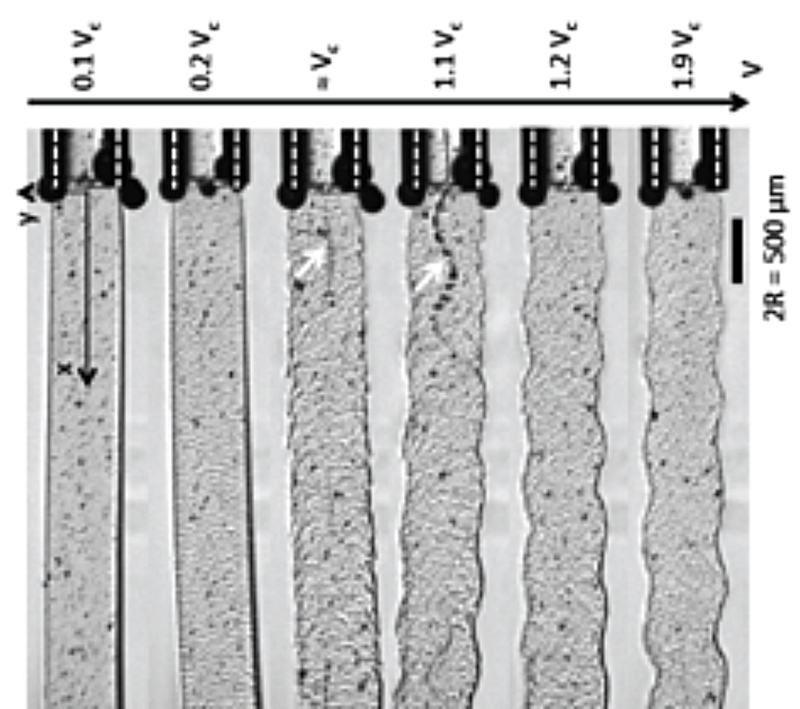 A preliminary experiment suggests that the helical instability is able to organize a collagen solution through extrusion in a way that is reminiscent of the « crimp » structure of fibrils in tendons at rest. This would pave the way to design biomimetic scaffolds for subsequent cell seeding and tendon replacement.